Homeowner Has Her Granite, but Stays GREEN Too! Granite is far from environmentally friendly, but Greenspiration Homeowner and Publisher, Trish Holder has a suggestion for how to have your granite but still be green! By now, my regular readers know that I am not a fan of imported granite. As far as I am concerned, granite has been mistakenly idealized by homeowners as a maintenance-free surface material — a myth that plenty of builders have been more than willing to perpetuate only because granite has become more affordable than ever – thanks in no small part to cheap, overseas labor. Worst of all, some granite peddlers have had the audacity to market granite as an environmentally friendly product simply because it comes from the earth. So does oil, by the way. All that said, I know that some people simply will not be dissuaded from their love affair with granite. And that being the case, I’d like to offer up a more environmentally responsible option: Scrap. 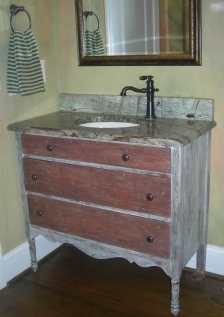 Read about my one-of-a-kind bathroom vanity made from scrap granite and old dresser!